Ever since I received a copy of Ottolenghi’s “Plenty More” for Christmas last year I’ve had my eye on this cake recipe. 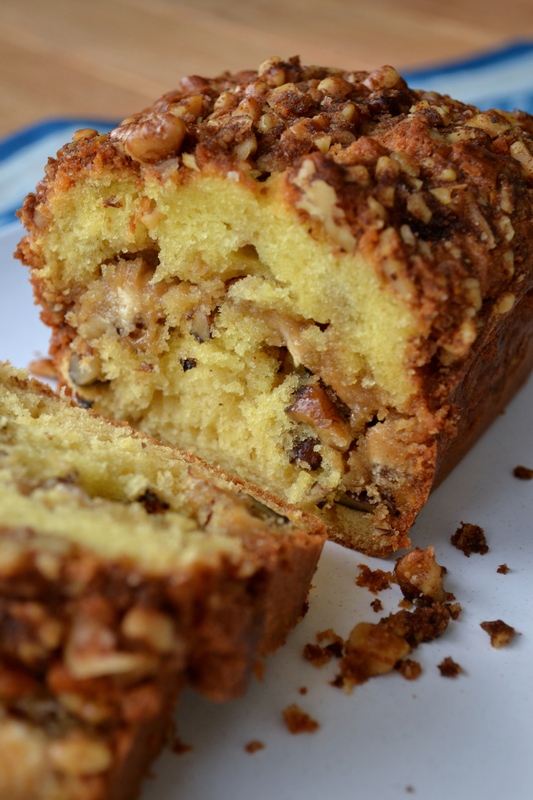 A delicious looking concoction of walnuts, halva and cinnamon baked into the centre of a light and fluffy cake. It just called out to be baked the moment I saw it. For those of you unfamiliar with halva, it’s a sweet made from sesame seeds and a copious amount of sugar, often studded with almonds or fruit for good measure. It looks a little like nougat but tastes infinitely more delicious and you find it in places such as Greece and the Middle East. I was first introduced to this delight a few years ago by my father in law who is the ultimate in halva aficionados. Needless to say it was love at first bite. Thankfully it’s not available in Singapore as if it were I would have to attend bootcamp much more than once a week. But every silver lining has a cloud, and the lack of availability rather put a dampener on my halva related baking plans. So it was with great excitement that my parents in law arrived to stay a few weeks ago, bringing with them a sizeable portion of halva – probably big enough to have pushed their suitcase into the overweight category and probably to push me that way too…! But my cake’s big moment had finally arrived! Showing a momentous level of self-control, I reserved the 170g halva needed for the recipe before inhaling the rest at what can only be described as an impressive alarming rate. My justification? Halva is full of sesame seeds which are full of magnesium which is incredibly good for you and difficult to find in other foods…I think. Just as that famous Guinness advert used to say, good things really do come to those who wait. This cake is a sensation. 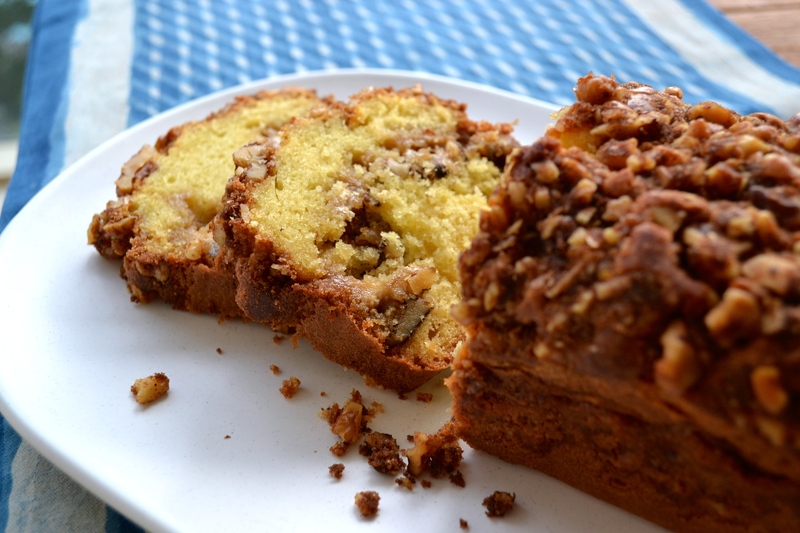 It’s a cake that would feel very at home in Greece being quite sweet and full of nuts, which is probably why the Perky Kebab enjoyed it so thoroughly. 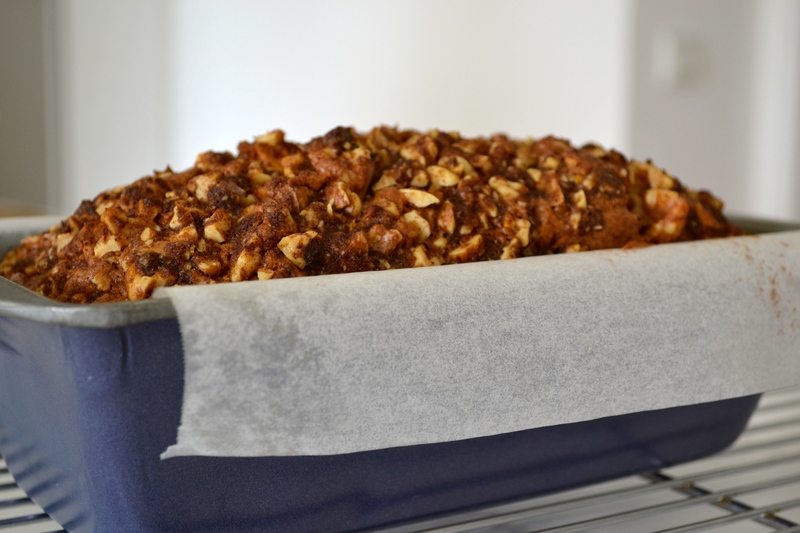 The walnuts add great texture with the warmth of the cinnamon coming through and lest we forget the fabulous addition of the sweet halva running through the centre. Having waited so long to make this you’d think I would have managed to get all the other ingredients ready. But obviously at the 11th hour I realised I had failed to procure any soured cream. So instead I swapped in some greek yoghurt (actually, Greek style…shhh, don’t tell the Perky Kebab!!) and it worked perfectly. Unlike other Ottolenghi recipes, it doesn’t call for thousands of ingredients or complicated process. 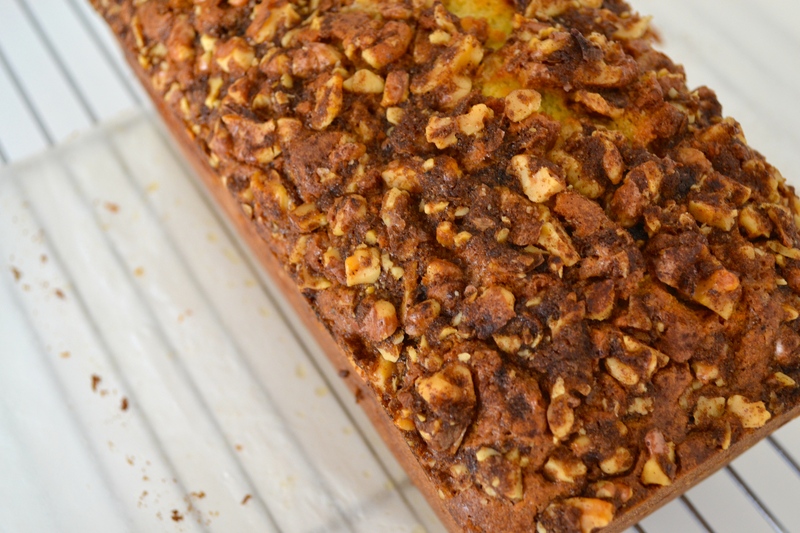 The only bit that takes longer than your average cake preparation is the browning of the butter which the nuts and cinnamon are stirred into and this very definitely worth that little bit of extra effort. As Mary Berry would say, it’s sheer heaven. 1. Preheat the oven to 180°c/160°c fan/320°f/gas mark 2½. 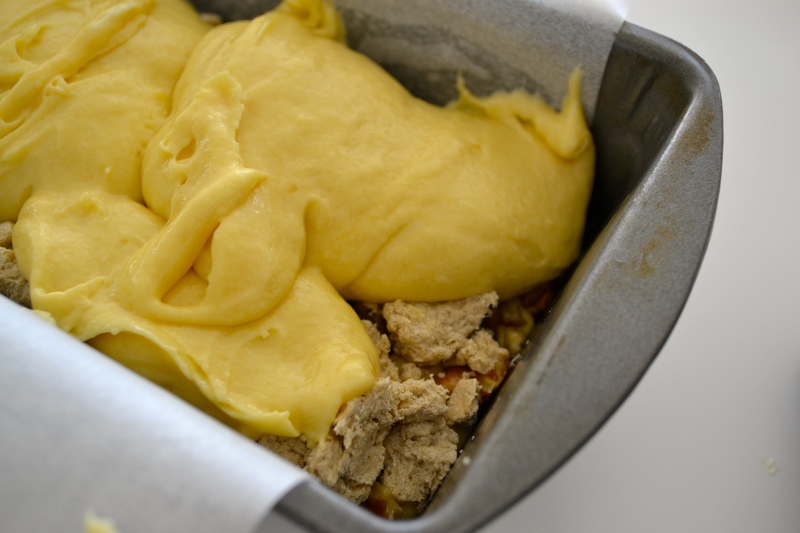 Grease a 12cm x 25cm loaf tin with a little butter, and line the base and sides with greaseproof paper. 2. First, make the topping by browning some butter. Put the butter in a small saucepan on a low to medium heat. Leave to melt, then let it sizzle for a few minutes until it’s light brown and smells slightly nutty. Remove from the heat and set aside to cool. 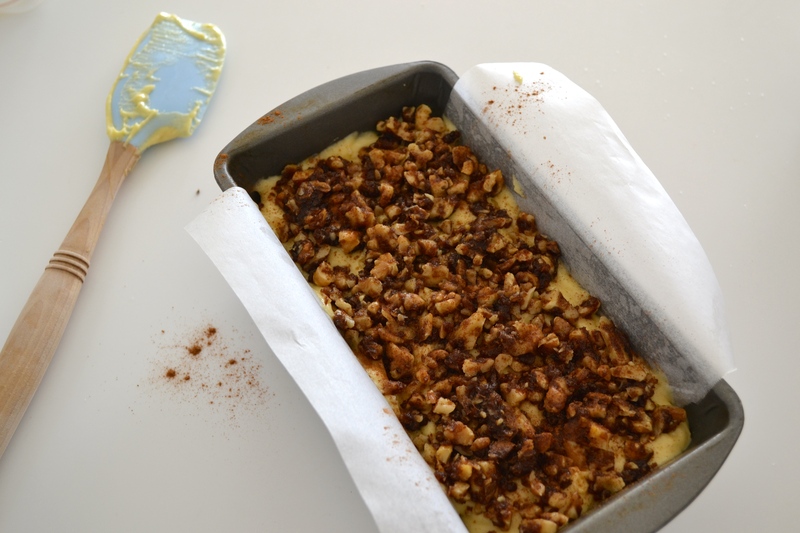 Once cool, mix the butter, walnuts and cinnamon together, divide the mixture in two and stir the sugar into one of the portions. 3. 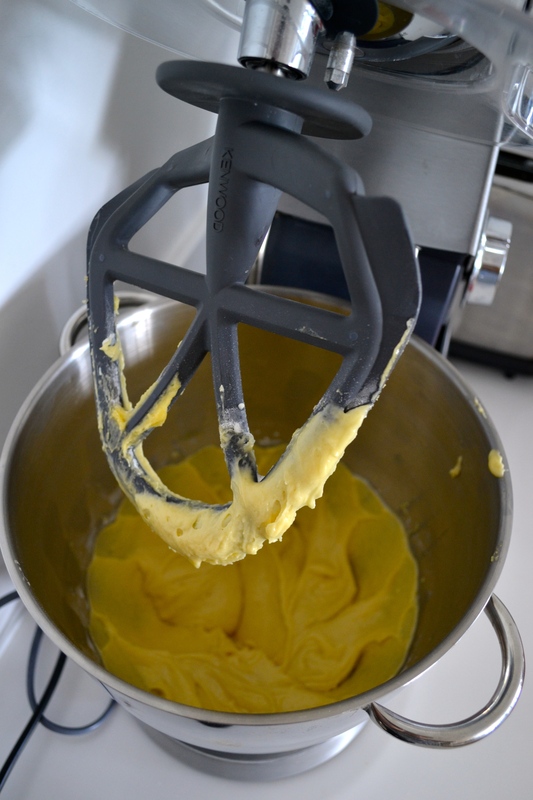 To make the cake batter, using either a stand mixer with the paddle attachment or an electric hand mixer, cream together the butter and sugar until light and fluffy, then add the eggs a little at a time. Sift together the flour, baking powder, bicarbonate of soda and a pinch of salt, and bit by bit add this and the sour cream/yoghurt alternately. Don’t over-mix everything though. 4. 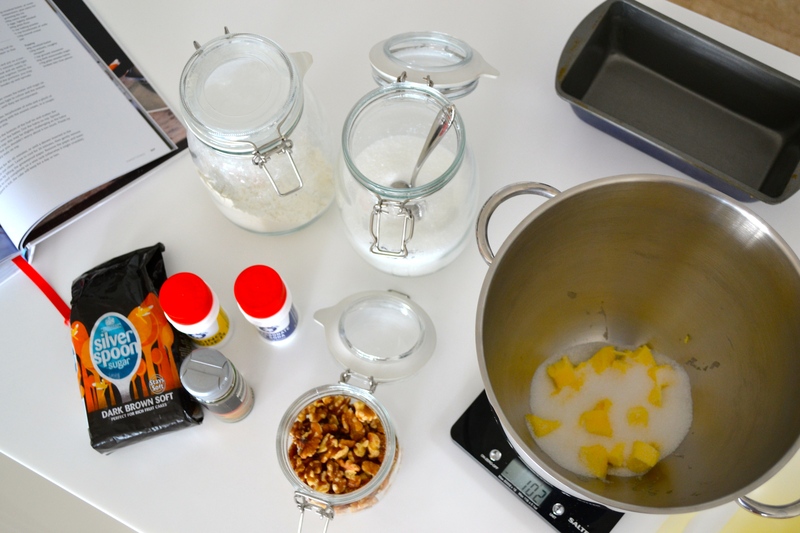 Spread half the batter on the base of the cake tin and evenly scatter over the sugarless nut mix. Dot the halva on top, and spread the remaining batter over this – the halva will drag a bit into the batter, but don’t worry about that. 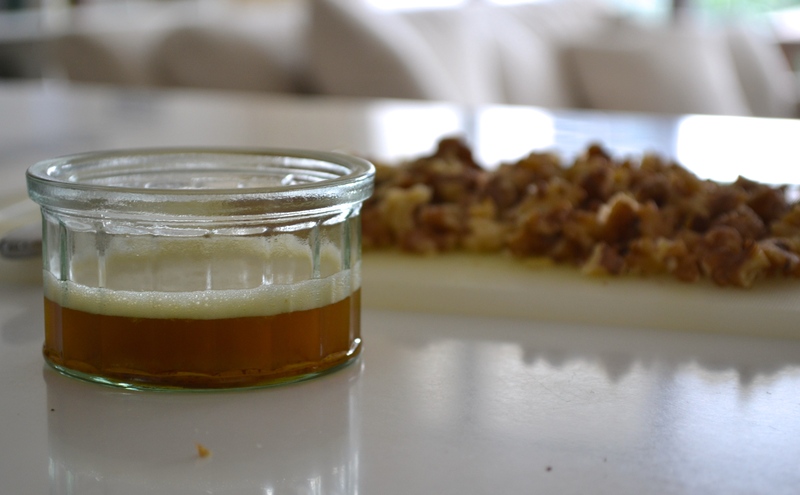 Finally, sprinkle the sugary nuts on top. 5. Bake for 40-45 minutes, until a skewer comes out clean. 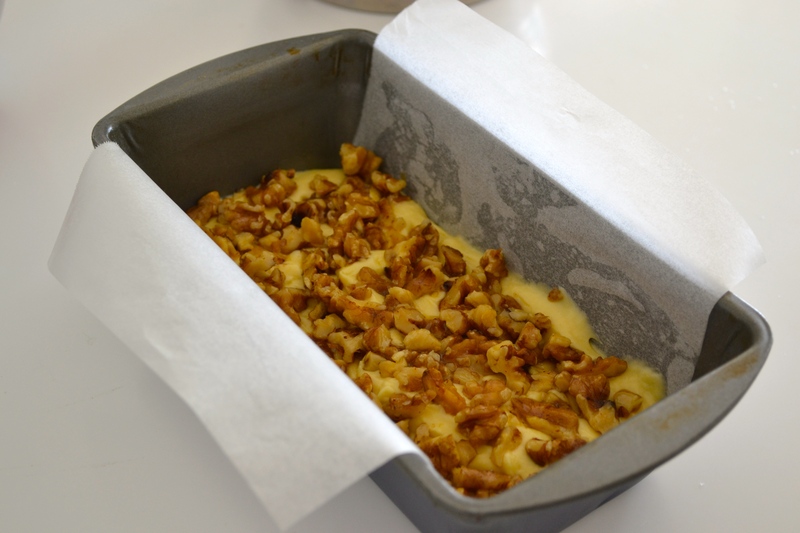 Leave to cool for 20 minutes, then gently remove from the tin by lifting the greaseproof paper. Take off the paper and leave the cake to cool on a wire rack (it may crumble otherwise). Wrapped, the cake will keep for a day or two. This looks absolutely divine!! I love the addition of the topping in the middle as well, it creates a beautiful layer!